Luca Mocerino earned a B.Sc. 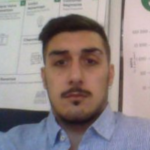 in Computer Engineering at Federico II University in Naples in 2015 and a M.Sc. at Politecnico in Turin in 2017. There, since January 2018, he has been a Research Assistant and Ph.D. Candidate in Computer and Control Engineering with the EDA group. His research interests focus mainly on deep learning on-chip and low-power/energy design techniques for digital ICs.